Unfortunately, the guiding principles that allow relationships to grow and flourish are far from obvious. The good news is that with education and effort, even very difficult problems can be overcome. There is an opportunity to increase satisfaction and develop a lasting relationship built on a more solid foundation. Move beyond judging, blaming, and defensiveness. Overcome common negative interactive patterns as partners get locked in power struggles, and vacillate between getting angry and withdrawing, pursuing and distancing. Develop insight into the origins of negative patterns, increasing mutual empathy and motivation to change old programming. Resolve conflict by communicating more openly and effectively, remaining responsive and respectful rather than reactive. Put “problem talk” aside, and focus on building solutions in a collaborative process that strengthens connection. Work as a parental team when there are children involved. Create “good times” to enjoy and remember. It is important to distinguish between the content of a conflict – what people are fighting about – and the process by which it is handled – how people are communicating, problem-solving, and acting with one another. It is almost always a breakdown in the process that makes a conflict unresolvable. 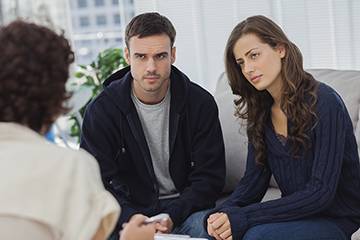 A good therapist can help couples gain clarity about their interactions and break these vicious cycles. When partners understand the impact He’s my number one!they are having on one another – through open dialogue in a safe, therapeutic setting – each person is in a position to consider alternatives for their own behavior and self-expression that are both assertive and responsive. Feeling cared about, understood and respected in the communication process sets the stage for effective collaboration and problem-solving, and with hard work even very difficult issues may be negotiated. Moving away from a reactive stance allows a shift in perspective, and new, positive possibilities present themselves. Partners can focus on solution building as they acknowledge their strengths, what is working now, and what will be happening differently when things are better in the future. Concrete goals can be established and worked on – involving roles, behaviors, thoughts, and feelings. Each person feels empowered by recognizing how she or he can take effective action and shape the future towards a positive vision of the relationship, furthering individual, couple, and family development.